COMPackage is a feature-rich, easy-to-use system that enables businesses to create total compensation reports for staff members. These benefit statements give employees an actual account of their total compensation. View a Sample Total Compensation Report or request a free demo. Total compensation reports can dramatically reduce employee turnover and improve morale.. Now, no matter how big or small your company is, you can finally start using these powerful tools. At COMPackage, we’ve developed a total compensation report that is robust enough to serve the largest corporations, yet affordable enough to work for even the smallest companies. Traditional benefit reporting services are expensive because they were created to provide reports for companies with at least 100 employees. Even if small business owners wanted to provide their employees with total compensation reports, they were unable to – until now. With COMPackage benefit software, small business owners have the ability to order only the number of reports they need for their business. They can then customize templates, enter data and calculate benefits, all in a secure environment. COMPackage makes things so simple that most users require only about 20 minutes to purchase the total compensation software and finish their first report. Read more about the features of total compensation statements for small businesses. For medium and large businesses with human resource departments, COMPackage offers the most robust total compensation reporting features at the lowest cost. With the innovative Employee LOADER, COMPackage benefit software can import data from an Excel spreadsheet, making it the perfect solution for companies that require reports for a high number of employees. The COMPackage TCR can help large and mid-size businesses produce benefit statements in-house at a fraction of the cost they would spend contracting them out to a service bureau. 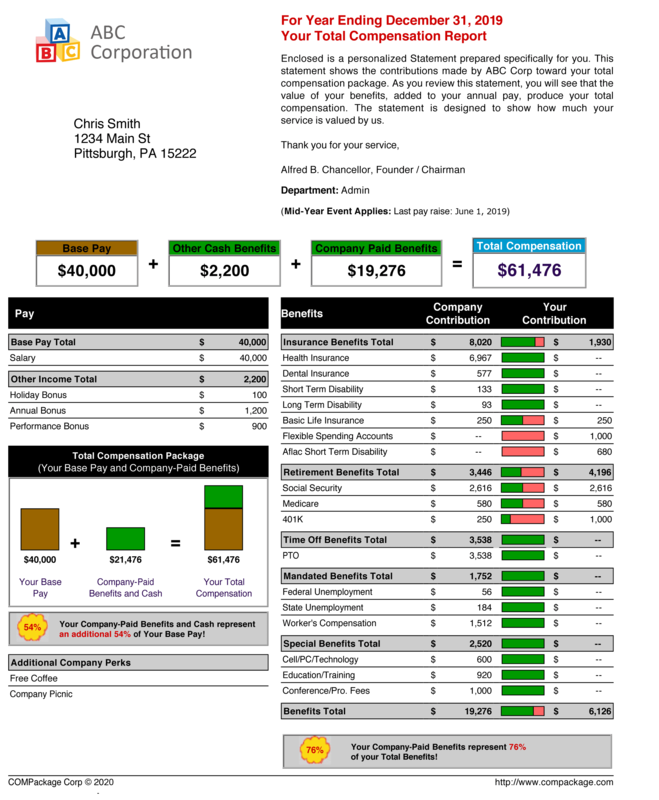 Read more about the features of Total Compensation Reports for Large Businesses and/or HR Departments or purchase today. Provide the solution to your clients and let them process it themselves. Make changes to the template to easily provide statements in any language and currency. A "Foldering" capability, allowing you to maintain clients in separate files within the COMPackage structure. An ability to include your company's benefits consultancy name in the footer of the total benefit statements. Provide your clients with an unlimited number of statements– no matter how many clients you have, and no matter how many total benefit statements are generated.